In Missouri, many homeowners use their HVAC units overtime to keep their homes comfortable. To avoid dealing with the significant amount of energy loss, installing energy-efficient windows is a great choice. 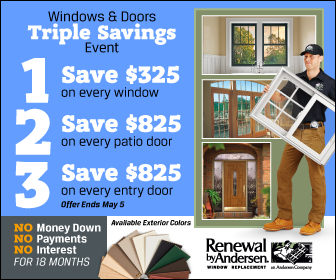 Renewal by Andersen® of St. Louis, the leading Chesterfield, Missouri windows company, offers windows that assure you of energy-saving benefits. In this entry, we focus on the features and benefits of our replacement windows. When a window is energy-efficient, it can help your reduce your utility costs. It can also provide a more comfortable atmosphere in your home by regulating interior heat. It blocks heat from escaping during cold months, and allows cool air to enter during the hot season. Several factors make up an energy-efficient window. For one, it needs the right type of material for its frames and panels. Vinyl and wood are some of the most energy-efficient materials available, as these can absorb the right amount of heat. Its glass also needs to contain superior energy-saving properties to regulate heat. Homeowners trust the quality of Chesterfield doors and windows that we provide here at Renewal by Andersen of St. Louis. We have a commitment to help them achieve a more sustainable and efficient home. Each of our windows has the ENERGY STAR® label, which serves as a proof of its energy efficiency. Designed to boost the efficiency of your home, our windows are made of Fibrex® material and High-Performance™ Low-E4® glass that help reduce the risk of energy loss. Our exclusive Fibrex material displays the look of an authentic wood, but is more functional. Our Low-E4 glass, on the other h and, outperforms other options, as it is more efficient in winter than traditional panel glass. Do you want to experience the Renewal by Andersen® difference? Start the path to a more sustainable and efficient home by calling us at (314) 332-2364 today.